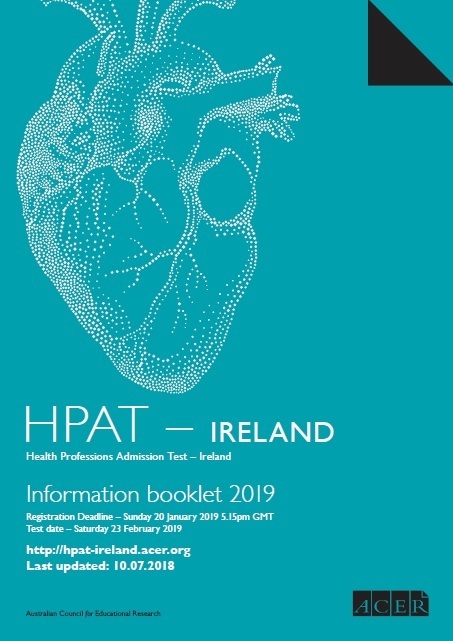 Questions in the HPAT – Ireland test are in multiple choice format. It is advantageous for you to develop your own strategies for answering this type of question. Each test section is separately timed. You are advised to work steadily through each section. It is not advisable to spend too much time on any one question. Read through all the alternative answers to a question, even if you think the first one is correct, before marking your chosen response. If you think you know the answer to a question, mark it, even if you are not certain. Go on to the next question and come back later if you have time. All questions have the same value, therefore by attempting as many questions as possible you stand the best chance of maximising your score. No marks are deducted for a wrong answer. If you mark more than one answer to a question it will be considered wrong. Answers should be marked directly onto the answer sheet, not in the test book. Answers marked in the test book will not be scored. You may do rough work in the margins of your test book. Scrap paper is not allowed. You will not be allowed to leave the test centre before the test has finished. For the Written English component (UL applicants ONLY) it is very important that the handwriting is clear and distinct. Candidates will disadvantage themselves if their writing is illegible.